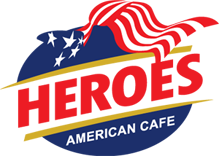 Live on the set of Heroes American cafe shooting a commercial with Fox. Win a $50 Heroes Gift Card. Just take a picture eating a Hot Philly and post it/ Share it on FaceBook. The Picture with the most LIKES will be the winner. ‹ Are you up for the Challenge. Are you up for the Challenge.